These two photographs were taken at the same time, probably by WO W.F. Bartlett. 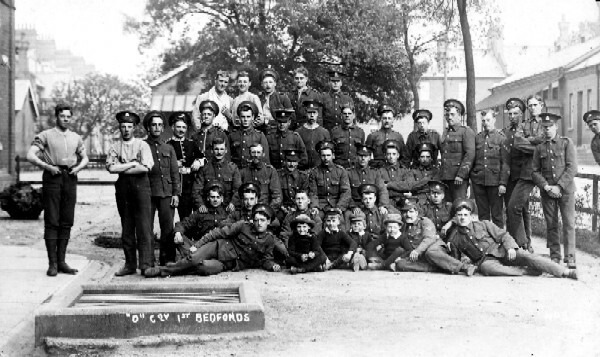 They a group of his 'Old Contemptible' comrades from the 1st Battalion and some of the Transport Section behind a pub in Bedford awaiting embarkation in 1914. 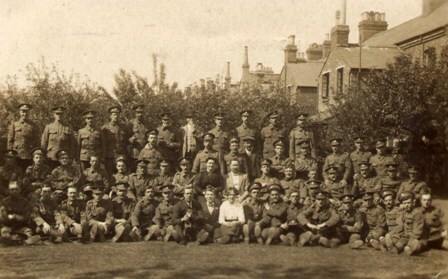 Many of the men in this photograph were killed or wounded in the coming months as around 80% of the original British Expeditionary Force that were sent to France became casualties by the end of November 1914. 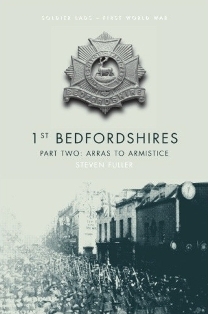 In itself, this is a photograph showing the celebrations in Bedford when the 1st Battalion returned from active service in April 1919. The scale of the crowd cannot be seen in this image, as local reporters recorded how the entire town and many of the outlying villages turned out to welcome their lads home, with people travelling from as far afield as Hertfordshire to join the welcoming committee. 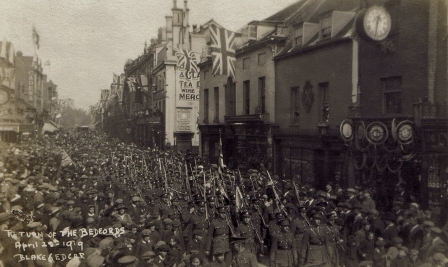 After this was taken, the procession disappeared into St. Paul's for a church service, then onto a civic reception, before marching back to the depot in Kempston to resume their duties. 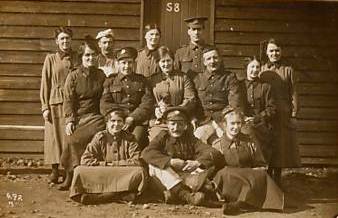 A group of battalion chefs and female cooks from the 1st Battalion; whether pre war or from the war itslef in unclear as no accompanying information came with the postcard. 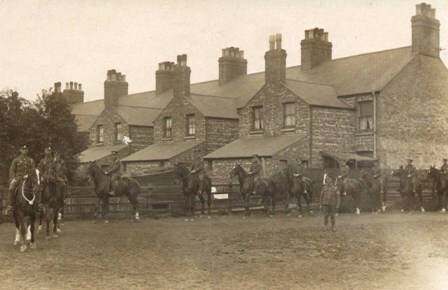 Another postcard, showing a group of men from D Company, although where and when it was taken is unknown. It appears to be pre war or from during the war and is either one of the four platoons from D Company, or what remained of the company after heavy losses during a battle.